The Band is modeled after the classic format of the bands of Glenn Miller, Count Basie, Duke Ellington and the many other bands of the Big Band Era. As such, the band's musical selections always contain many well known classic tunes which reflect those familiar sounds.Members of the Liberty Swing Band are Professional and Semi-Professional musicians from the Greater Wellington Area all sharing a love of performing Big Band music. The compere will be Ian Johnston. The band is making its first foray into Havelock and will perform in the historic Town Hall, renowned for its acoustic properties. There will be three concerts, an evening one on Saturday (7:30pm), a 4pm matinee on Sunday and a lunch time concert on Labour Day (1pm),where cut lunches will be on sale. Seating is Cafe-style so bring your nibbles and refreshments. Doors open 3/4 hour before each show so come early and get the seat of your choice. 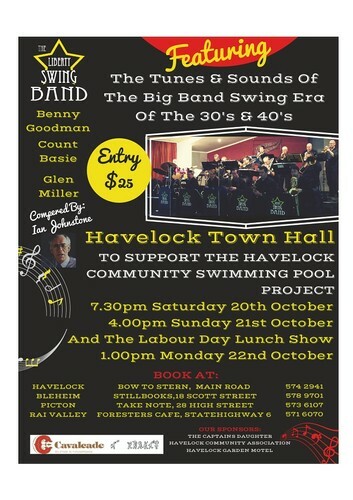 The Band is performing as a find-raiser to support maintenance of the Havelock Community swimming pool. The event is sponsored by Havelock Community Association, Havelock Garden Motel and Captain's Daughter Restaurant.